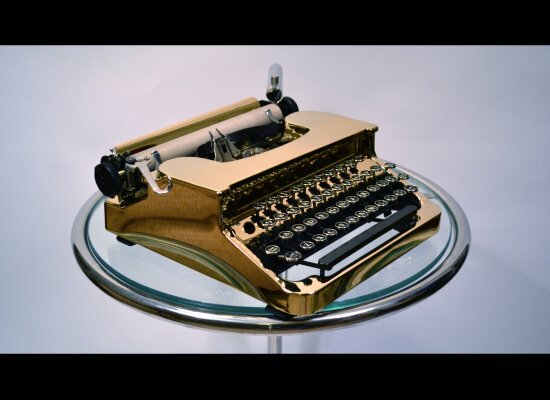 Perhaps, like me, you've seen Kasbah Mod's beautiful custom typewriters. But I didn't know that "around 75-100 machines are sold each month at prices ranging from $200 to $1,200." The success of Kasbah Mod and USB Typewriter make me start to believe that the time is ripe for what McGet calls a 21st-century typewriter. What do you think? Steve Soboroff collects typewriters of the famous (L.A. Times story including references to the typewriter renaissance and a comment from me). Zach Houston makes a living composing poems in public on a typewriter (NPR story complete with a clip from Leroy Anderson's "The Typewriter"). Do you have a personal relationship with a typewriter? Do you remember using one that you loved? Your father's or your grandmother's? Do you use one now? We'd love to hear your story and if you have a photo, all the better. We will be collecting them for our website on the Typewriter in the 21st Century to coincide with the release of our feature film in Fall, 2012. Obviously the Typosphere has a few stories about, and even if you're not part of the group proper, I'm sure Gary would be happy to hear from you. This looks like a fascinating documentary on the Linotype. And it whets my appetite for The Typewriter (In the 21st Century). Up Up Up - into the Typosphere! Typewriters return to the skies. Rev. Munk recently alerted us that Zooey Deschanel (or at least her character) collects typewriters on the TV Show "New Girl." Now my wife has alerted me that Zooey's "quirkyness" was recently parodied on Saturday Night Live, including the typewriter collecting (at 2:15). Typewriters are on the cultural radar for sure! How is a Typewriter Like Google? Well, if it's a Chinese typewriter -- or any designed to handle a large number of ideograms -- then there's a certain level of prediction that can be built into the system to help figure out "what's next." And in case you've never seen one in action, here's some footage of a Chinese typewriter in use. Note the two-handed motion to slide the symbol-picking mechanism as the type-tray is also being arranged. Thanks to the Typewriter Movie guys for the tip! As a historian who cares about objects, I'm pleased by this new appreciation for typewriter aesthetics, and I'm hoping it will mean a decline in keychopping. Keychopping is the arguably pernicious practice of removing a typewriter's keys to make jewelry or to decorate olde-tyme projects. To typewriter enthusiasts and collectors, keychoppers are the enemy, destroying the integrity of typewriters and rendering them useless scrap.